Rumors have been rampant concerning Olin Library’s future. Moving certain programs into the building, moving quiet and loud floors, and construction have all been in question. I sat down with Olin Library Director Dr. Jonathan Miller to understand the renovations taking place within the building in the next year. Library personnel had already been in contact with the contracting company EYP; its workers completed the Bush remodel as well as other projects on campus before, “so they know the campus well,” said Dr. Miller. However, Olin will not be completely remodeled as Bush was; some of the same library set-up will remain intact. On the other hand, though the contractors and Rollins employees need to determine where to relocate programs, it was confirmed what programs would be potentially moving into the library: Disability Services, Competitive Scholarships, R-Compass, Johnson Center, Hamilton Holt advisors, and the Center for Career and Life Planning (CCLP). The program wants to create a “one-stop shop,” according to the Strategic Planning bulletin. Many programs like the CCLP that help promote success during and after students’ time at Rollins will be moved closer to the center of campus. 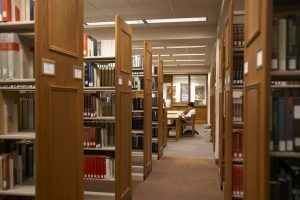 “The idea is that the library is already one of the most popular spots on campus; students are already coming into this building, so if we put Career and Life Planning… [here then] students’ lives as they work through the whole four years…” will be more successful because of its accessibility, said Dr. Miller. The library staff has been working closely with the Student Government Association (SGA) to discuss these changes. A member of SGA was included in many meetings; SGA President Matthew Cassidy was especially vocal. The Information Technology and Tutoring and Writing departments, as well as the present library faculty, would stay in the building. Of course, this causes spacing issues. This is where the contractors come in. While there will not be any additions to the library, there will be construction going on within the existing structure. The influx of people and programs has been taken into consideration. “It’s going to have an effect on the bathrooms. It’s going to have an effect on the air-conditioning. It’s going to have an effect on where people sit. So, one of the things the architects are doing is thinking about how that might be arranged,” which is a discussion that will continue through April. The shift toward technology and away from print is also being taken into consideration. Dr. Miller suspected some of the 100,000 periodicals the library currently houses, including journals, would be the first to go if they needed to make more space. However, he clarified that the library would continue to be a “hybrid” area committed to both, “and will continue to be for a long time…. We’ve invested a lot in taking those journals, the same journals… and getting an online version of it.” The next removable part of the library would be one of the four computer labs, which could be used in another building on campus. The projected timeline is to have all changes completed by the end of 2018. Although there will be work going on during the 2017-2018 school year, it will be in stages. While Dr. Miller did not deny that some disruption will probably take place, there will not be a point where the entire building is inaccessible.